Our 31st Annual Show was held at the end of August. Visitors were greeted by a riot of colour as they entered the hall at the Nairn Community & Arts Centre. As they wandered round the pot plant section they marvelled at the quality of the plants on the benches and in the hanging baskets. There were exquisite floral arrangements in photo frames and tea cups, and plenty of beautifully grown fruit and vegetables. The standard in the home-baking, preserves and wine sections was high, and a lot of patience and careful work was displayed in the handicraft section. Chairperson Helen Macfarlane-Grieve, was pleased to see many new exhibitors and thanked all who took partand all the sponsors for supporting the Club. However, she was disappointed that more children had not entered and hoped to see more next year. Helen thanked member Sheena Maclean, for all her hard work printing and collating all the schedules and processing all the entries and results. Local Councillor, Michael Green presented the prizes. He congratulated the Club on the standard and colour in the hall and stressed the importance of the Show and the Gardening Club’s role in Nairn. Ali Illes and Donald Cheyne shared the honours in the vegetable section. Billy Milne’s Gladioli helped him to take most points in the cut flower section while Robert Holmes produced the best in that section with his immaculate yellow decorative Dahlias. 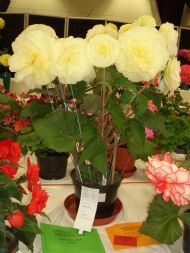 Rhianna Logie won the Children’s 8 to 15 years section for the third year running but it was George Pirie who won the Best in Show with his magnificent pot of lemon large headed Begonias. 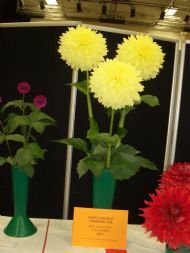 Visitors left with raffle prizes and plants having enjoyed an excellent Show and a delicious tea.